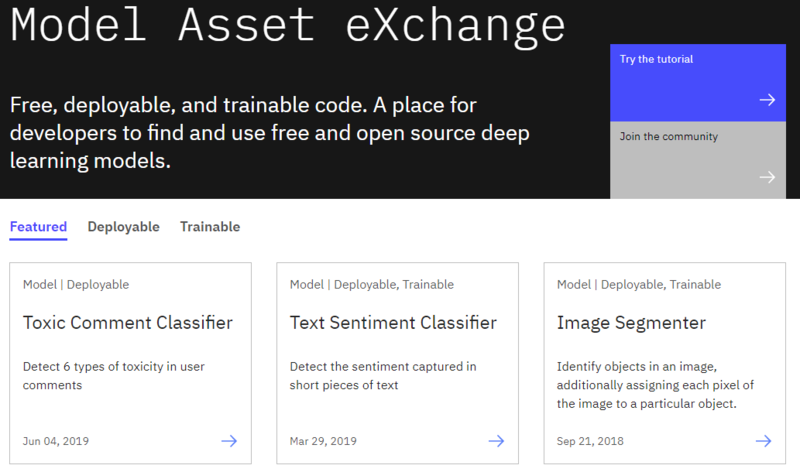 The Model Asset eXchange (MAX) on IBM Developer is a place for developers to find and use free, open source, state-of-the-art deep learning models for common application domains, such as text, image, audio, and video processing. 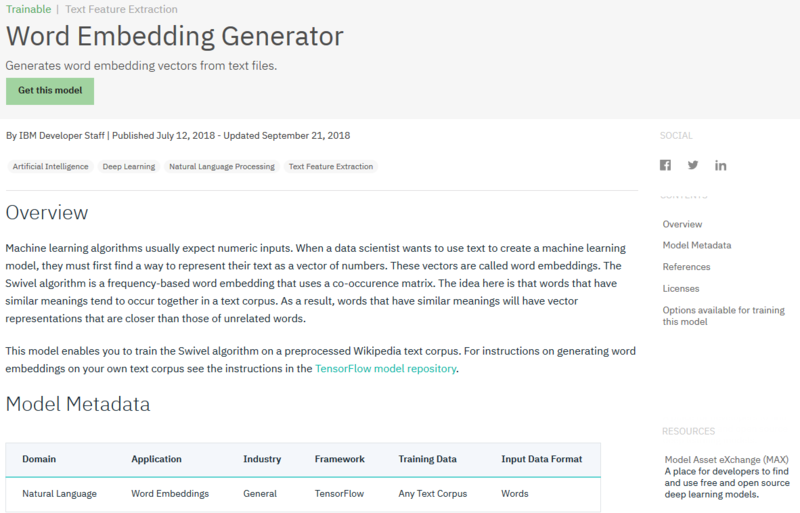 The curated list includes a broad selection of deployable (ready-to-use) models and trainable (customize-before-use) models. Deployable deep learning models on MAX have been researched, evaluated, pre-trained, packaged, and published as Docker container images on Docker Hub and are ready for deployment in local or cloud environments using Kubernetes. 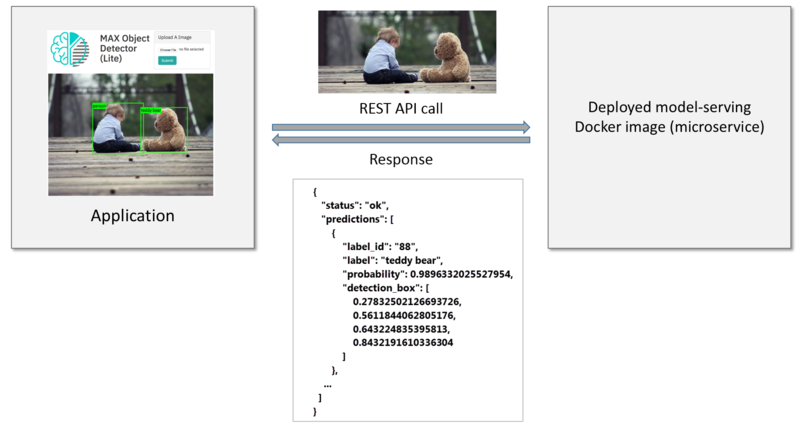 Each model-serving Docker image implements a microservice that exposes a REST-API that applications (or other services) invoke to consume the encapsulated deep learning model. In the example depicted below, a web application calls the Object Detector microservice, providing an image as input. The microservice processes the image, invokes the model, post-processes the output, and returns the result (“objects that were identified in the image”) in an application-friendly JSON format to the caller. The caller does not need to know anything about the deep learning model that powers the service, the framework that was used to implement and run the model, or the native model inputs or outputs because these details are hidden by the microservice. 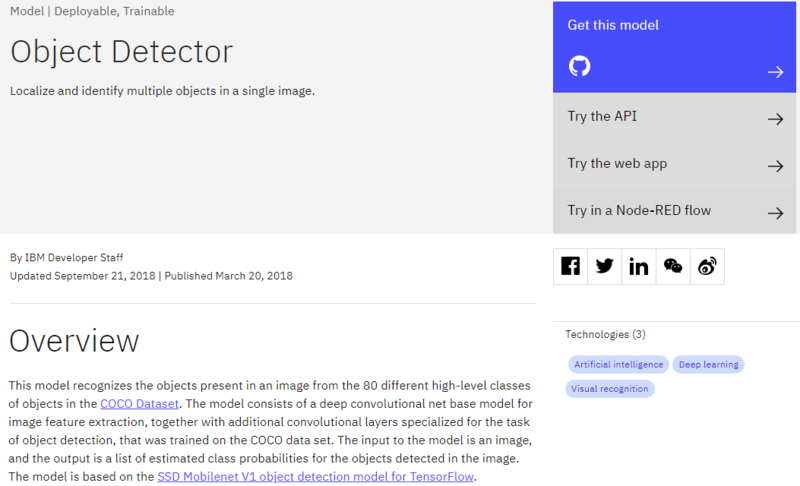 On the model exchange, you can filter deployable models by domain (classifiy audio content, classify video content, and identify entities in images), learn more about the models (underlying research, training data sets, and licensing information), test-drive the model (without having to install anything), and explore deployment and customization options. A popular model is the Object Detector. Some models include sample applications that illustrate how to use the model. You can download the source code (it’s typically published as a code pattern, such as this one) and use it as a starting point to build your own application. Trainable deep learning models on MAX have been researched, evaluated, and tested, but not pre-trained. You can train these models using the Watson Machine Learning service on IBM Cloud or the Fabric for Deep Learning framework. Training instructions are included in the model repository. 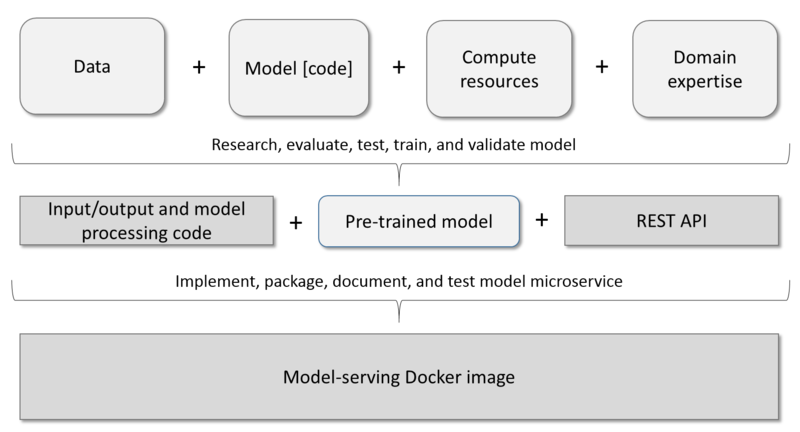 Unlike deployable models, trainable models are not published as Docker images. 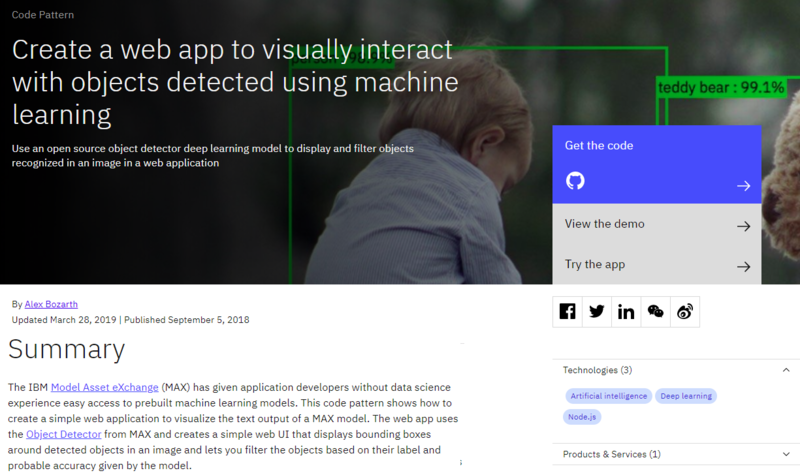 You can deploy and publish them on the Watson Machine Learning service using the REST API, the Watson Machine Learning CLI, or the Python library. To learn more about the Model Asset Exchange, take a look at the “Get started with the Model Asset Exchange” tutorial. It walks you through the model microservice deployment in a local environment and outlines how to consume the service from a web application.